Whether you are looking for some adventure or just hoping to see jaw-dropping views within the Siskiyou National Forest, the Oregon Redwoods Trail, just southwest of Brookings, offers both. One of the most popular trails in the region, this trail offers a short hike (1.6 miles) which loops back to the beginning through a mixed-species of redwoods. Marvel at the world's tallest trees north of California and walk, run, take in the sights, or combine this trail with others for more challenging strides. The trail begins along Peavine Ridge in the Winchuck River drainage and is easily accessible from Highway 101. 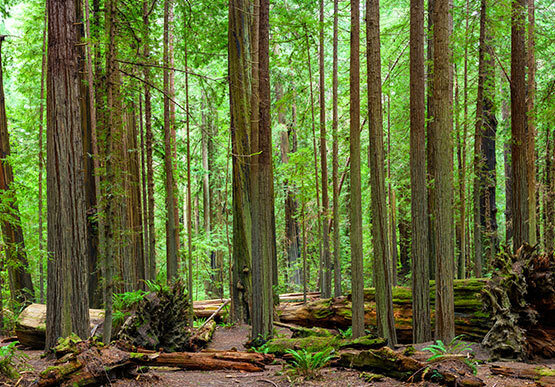 Feel free to bring your furry companion, as the Oregon Redwoods Trail is dog-friendly. Where can I hike on the Oregon Redwoods Trail? The Oregon Redwoods Trail begins on the Oregon Redwoods Barrier Free Trail #1106 along Peavine Ridge in the Winchuck River drainage. It loops down to the west into upper Moser Creek drainage. From Brookings, take Winchuck River Rd off Highway 101, make a right on Peavine Ridge Rd and follow to the end of the parking lot. Take the shorter trail to the “cool, burnt tree” about a 3/4 mile down. Are there giant redwoods in Oregon? Yes. The Oregon Redwoods Trail, just southwest of Brookings, is one of only two places to view the world's tallest trees north of California. If you’re vacationing to Oregon's Southern Coast, head to these trails from Brookings, Coos Bay, and Gold Beach and view these ancient and majestic redwood trees.